One Big Happy Review - TV NBC - Are You Screening? One Big Happy, NBC‘s latest sit-com effort, is set to have a great premiere just off the back of promotion by executive producer Ellen Degeneres. The real question is whether or not people are going to come back, and if it can expand its market beyond the viewers who are dedicated Ellen fans. One of the best indicators of its success (or lack thereof) may be its lead-in, Undateable. The shows are well-paired, with not only much in common, but a similar comedic style. They are also shows that aren’t exactly the kind of efforts that will shoot out of the gates. They need to grow on you a bit before you come around to appreciating what a blast they are. That’s a tough road in today’s world, as Undateable fans can attest, since it wasn’t a sure thing it would be returning for a while. In One Big Happy, Lizzy (Elisha Cuthbert) and Luke (Nick Zano) have been best friends since they were kids. Lizzy is a lesbian, which makes it a little less awkward (and less rom-com-y) when they make a pact that if they aren’t married by the time they’re 30, they’ll have a kid together. They live together now, and they’ve been trying to get Lizzy pregnant, but artificial insemination isn’t a perfect thing, so they haven’t quite managed it yet. Still, they’re both committed to the idea. Then Luke meets Prudence (Kelly Brook), an unbelievably cheery, British woman who is about to be deported. They fall hard for each other, and suddenly decide to get married. It isn’t just so Prudence can stay in the country, but that’s in the “positives” column. This leads to Luke getting to announce that he’s married at the same instant that Lizzy announces that she’s finally pregnant. Figuring out our “One Big Happy” becomes much of the show’s effort, and the newlywed phase frequently conflicts with the having a baby phase. Plus, we throw in trying to get someone in Lizzy’s life, which is a bit tricky when you have to explain this scenario. The show is a “builder,” and one that falls in line with several efforts of the last few years that need you to fall for the characters more than the laughs, and most of those shows have struggled. The difference here is that most of those, that survived (Community, Parks & Recreation, New Girl, About a Boy), have more of an ensemble to help set the stage. Where this show sets itself apart, and it perhaps feels somewhat Ellen-inspired, is in the details of the characters. Lizzy is serious, leaning toward type-A, and doesn’t “let loose,” but in a normal way. This is her personality, but it’s an actual personality, as opposed to a shtick. Luke isn’t a very serious guy, but he’s an actual person. You suspect a very believable backstory that has these two ending up where they are. Best of all, Prudence, who is bubbly, and devil-may-care, avoids being the “dumb one” you practically have to expect. Taking that to even another level, she is, shall we say, not at all displeased with her well-endowed frame, and she is still allowed to stay out of the “bimbo” category. Instead, she’s adventurous, extroverted, and as we learn eventually, comes from a long line of overly overtly happy people. There’s a shift in theory at play here, at least, it seems, in theory. Instead of having hilarious characters who exhibit some similarities either to the people you hang out with, or the people you and the people you hang out with make fun of (which is basically the industry standard attempt), these characters just are the people you hang out with, thrown into an unusual situation. As I’ve said, there’s something Ellen-y about that idea, and it’s a good one. On the other hand, it isn’t one that you’ll call the funniest show you’ve ever seen. On the other other hand, you like your friends, even though they aren’t the funniest people on the planet. The supporting cast is also a major positive to the show, and though they only get so much time in the first few episodes, they manage more depth than you’re used to as well. 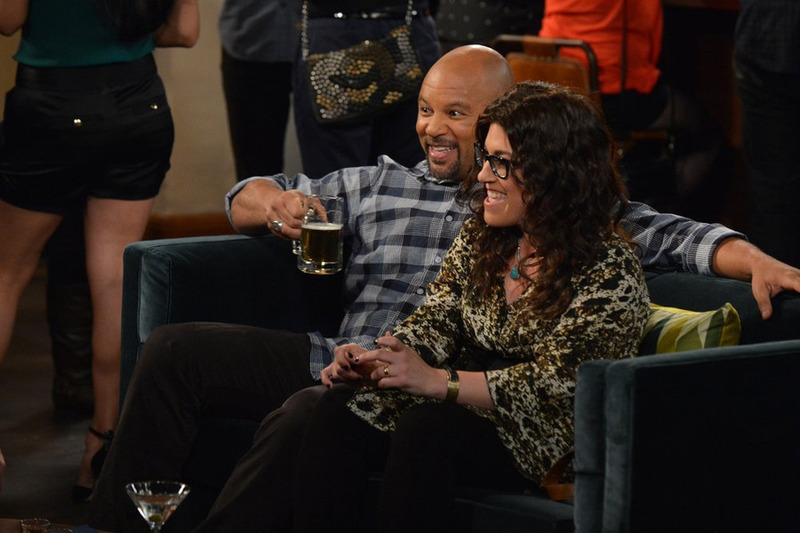 Rebecca Corry and Chris Williams are brilliant as the “couple friends” that are closest to Lizzy and Luke. This isn’t a show that will have you rolling, but after a few episodes it will be the one you’re looking forward to most. It probably compares best to the unfortunately short-lived Happy Endings that Elisha Cuthbert came from, only without the push for rapid-fire zingers. The hurdle here is the complexity of establishment required of the pilot. There’s too much to do for a rock solid first episode that can win over audiences immediately. If it can keep people around for five or six episodes, it will have a serious following. It’s worth giving that chance, because it has a workable theory behind these people, and Prudence (though the irony will be lost on everyone) could turn into one of the most popular characters on television. Here’s to hoping people appreciate this one, because I really want it to be around long enough for the kid to show up. Best friends Lizzy (Elisha Cuthbert, “Happy Endings”) and Luke (Nick Zano, “2 Broke Girls”) are like family. As kids, they saw each other’s parents go through divorce and have ever since formed an inseparable bond. Now, all grown up and still single, they’ve decided to start a family of their own, but in a non-traditional way. Lizzy, who is a lesbian, wants to raise a child with Luke by her side. Then one night, Luke falls for Prudence (Kelly Brook, “Smallville”), a free-spirited British girl who’s due to go back to England in a matter of days. Then, just as Lizzy discovers that she’s actually pregnant, Luke announces that he and Prudence have gotten married and in an instant — a different kind of family is born. The cast also includes Brandon Mychal Smith (“Get On Up,”), Rebecca Corry (“2 Broke Girls”) and Chris Williams (“Satisfaction”).